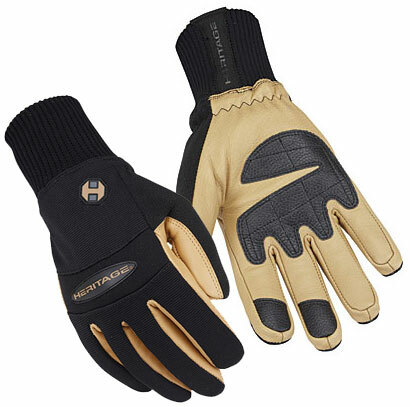 Offering a high quality warm winter work glove, these Heritage gloves are perfect for working around the barn in cold weather. They are made from a high quality goatskin leather which is three times stronger than cowhide. They have a waterproof and breathable Hipora barrier which keeps your hands dry when you're out working in cold or wet conditions. There is a thinsulate C40 for warmth and a soft inner lining for comfort. Also featured is a durable stretch Spandura top, elastic knit cuff to securely hold gloves in place, abrasion resistant reinforcement added to the palm, index and middle finger tips for increased grip and extended wear, a micro fleece brow wipe thumb, durable neoprene padded knuckles for increased flexibility and double stitched critical outward seams. This is the ultimate winter work glove! Comfortable custom fit with our stretchable Spandura® material and durable Goatskin leather construction. This glove is designed to increase dexterity and fit properly while performing all work related tasks. The elastic band gather helps to hold the glove securely on your hand. Made of genuine Goatskin leather. Goatskin leather is three times stronger than cowhide. Durable nylon stretch Spandura® top to allow air to flow. Thinsulate C40 for warmth . Abrasion resistant reinforcement added to the palm, index and middle finger tips for increased grip and extended wear. Terry Cloth thumb to wipe away perspiration.